I love this research about human irrationality. 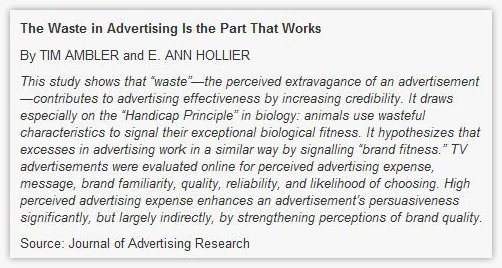 Ad Peackcocking, or more euphemistically, showing your "Brand Fitness" takes its cues from the "handicap principle" in biology whereby animals use wasteful movement and appearance to show biological superiority. From a marketing point of view, Ad Peackocking ("wasteful" ad spend) appears to embue trust (the product is safe) and dominance (the product is popular). The dominance provides a short-cut heauristic for popularity and, "how can everyone be wrong? it must be good" halo effect. Yet another example of the behavioural sciences holding the key to the economic kingdom. Of course, it still reamins very difficult to convince the C-Suite about this kind of thing. Multi Channel Attribution and Multiple Touchpoints do not fit into the excel cell titled "Total". It forces them to have faith and patience which is diametrically opposed to the very short-term requirements of shareholders. I wear both hats and I know the answer isnt easy. But shareholder short-termism is for another post.